Biogeochemistry—winner of a 2014 Textbook Excellence Award (Texty) from the Text and Academic Authors Association—considers how the basic chemical conditions of the Earth, from atmosphere to soil to seawater, have been and are being affected by the existence of life. Human activities in particular, from the rapid consumption of resources to the destruction of the rainforests and the expansion of smog-covered cities, are leading to rapid changes in the basic chemistry of the Earth. This expansive text pulls together the numerous fields of study encompassed by biogeochemistry to analyze the increasing demands of the growing human population on limited resources and the resulting changes in the planet's chemical makeup. The book helps students extrapolate small-scale examples to the global level, and also discusses the instrumentation being used by NASA and its role in studies of global change. 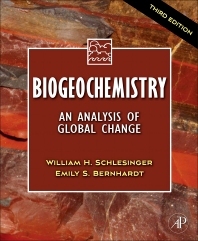 With extensive cross-referencing of chapters, figures and tables, and an interdisciplinary coverage of the topic at hand, this updated edition provides an excellent framework for courses examining global change and environmental chemistry, and is also a useful self-study guide. Upper-division undergraduate and graduate students in geochemistry, ecology, earth, and soil sciences, especially those with interest in global change or environmental chemistry. Dr. Schlesinger is one of the nation’s leading ecologists and earth scientists and a passionate advocate for translating science for lay audiences. A member of the National Academy of Sciences, he has served as dean of the Nicholas School of the Environment at Duke and president of the Cary Institute of Ecosystem Studies. He lives in Down East Maine and Durham, N.C. and continues to analyze the impacts of humans on the chemistry of our natural environment. Dr. Emily S. Bernhardt is Assistant Professor at Duke University in the Department of Biology. She currently teaches biogeochemistry. A graduate of University of North Carolina Chapel Hill (B.S) and Cornell University (PhD.) and her areas of interest include biogeochemistry, ecosystem ecology, stream and wetland ecology, urban ecology, and restoration ecology.